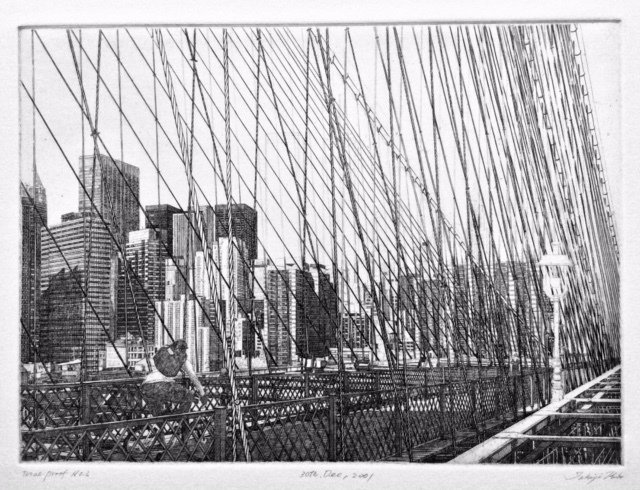 In March 1997, I visited New York City for the second time. 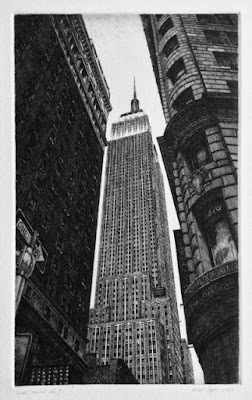 I was informed by Kanetake Hamachi the organizer of Gallery Uesuto in Ginza, Tokyo where I held the photograph exhibition of London landscape, that there would be an in New York. When I asked about this in detail at his office, they indicated that there is a Japanese organization in the United States called the Japanese and American Association in New York, it holds various events throughout the year and I was informed that they were looking for artist to exhibit art work. I sent a work list containing the images of my works to the association advisor, Kouji Ichida. I received an answer from Mr. Ichida, and he stated he would like to display the Nature Morte engravings. I immediately responded that I would hold a solo exhibition with the requested works and got ready for the event. On March 27th, I arrived at JFK airport with Marie, and the subway at Cathedral Parkway 110 subway station near Cathedral St. John Divine and Columbia University. There was an apartment where Mr. and Mrs. Ichida lived near the station, and we lent a room of the lower floor sharing with a Japanese roommate, and started our New York living. I framed the exhibit works at the frame shop nearby and headed for a solo exhibition. There was an Association at the eleventh floor in the building on 44th Street near the Grand Central Terminal, and that hall was the exhibition venue. A lot of members and my friends attended the opening reception, and it was big party. I was pleased to find out that it was a rather popular exhibition, in spite of it being a work exhibited only with dead motifs. It was a sweet memory, we celebrated the exhibition with Risaburo Kimura who was a printmaker and lived in New York for a long time and my friend at the Oyster Bar of the Grand Central Terminal, after the reception. Risaburo passed away in 2014, and I miss him and New York. Dan Welden, whom I had not met for a while since splitting in 1979, in Boston, M.A, attended my exhibition and he was greatly pleased with the reunion after such a long absence from one another. He seems to have built a studio at a town close to the sea called Sag Harbor in northern Long Island. Dan developed a new process using polymer plate called “solarplate,” and he recently seem to be making art work as an artist, and I promised to visit his studio. After the exhibition was over, I wandered around the city taking my camera with me, and took several images and reported data from many districts. In April, I visited Fitch-Febvrel Gallery which I had not been to in eighteen years, I met the same receptionist at the entrance of same building on 57 Street and went to the same room and reunited with Mr. Andrew Fitch. I said to him, “I am back!” Mr. Fitch and his assistant Cindy welcomed me. Mr. Fitch looked at my landscape engravings of London and Paris very carefully, and he made a telephone call and took an appointment with the Modern Museum of Art to show some of my new works. I exchanged an excited handshake with him and went out of the gallery. Mr. Fitch told me to leave some of the works with him and I was happy that Mr. Fitch was requesting to show my art works, and this filled my heart with joy and warm feelings. The City of Manhattan is divided into lattice grid street structure, east, west, north and south on the avenues and the streets, Broadway is the only one running obliquely, and cuts the land into a triangle and giving a sense of tension. When you cross Times Square towards downtown and intersect 33rd Street, you can see the Empire State Building build in the valley of the high buildings. 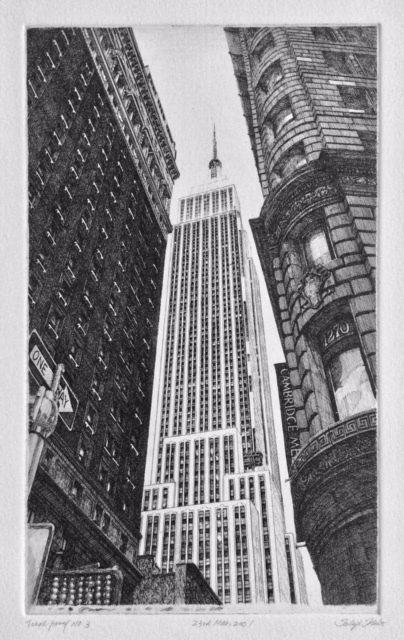 The sky between the buildings on both sides seemed to connect to the ground, and the narrow space showed the Empire State Building and even made it look higher and more dignified, and it was a composition with the highest sense of urgency, felt that I had to make it a work. I devised the idea before starting production. After expressing the building, the left and right backlighting in the dark and heavy feeling by etching, I attempted to express the solid feeling of metal and glass appearance by drawing the center Empire precisely with engraving. 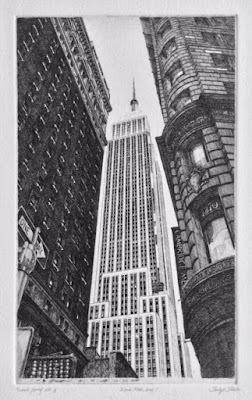 “The Empire State Building,” is my first work that dramatically expressed using the corroded thick line of etching and the comparison of engraved thin lines engraving. When drawing the Empire Building’s guidelines which guide engraving with a needle, I noticed that in one of the upper floor levels, it seemed to be higher than the other floors. I thought it was a curious difference, but I engraved it as it was and completed the work. In 2002, when I visited the print room of the New York Public Library and showed this work to the curator Roberta Waddel, and then when I pointed to the stair and I said "Only this floor is higher than other floor,” and asked if knew why? Roberta taught me the unbelievably story about this case. She said, "It might be because an airplane collided with the Empire State Building." I looked for articles and pictures of the crash accident at the Strand book store but I could not find it, it was a mystery for a long time. Since I posted a retrospective article on my website, I tried to verify it in detail, and enlarged the photograph that I shoot. When counting down from the 86th floor where there is an observatory, the 32nd becomes the higher floor than the other floors; unfortunately it was not the floor where the aircraft that Roberta imaged was a collision issue. The appearance has been successfully restored, but, in order for us to climb the 86th floor observation deck we need to get off the elevator once on the 80th floor and change to a different elevator because there is a trace of the accident left in the structure, the truth is sometimes a mystery to be found. 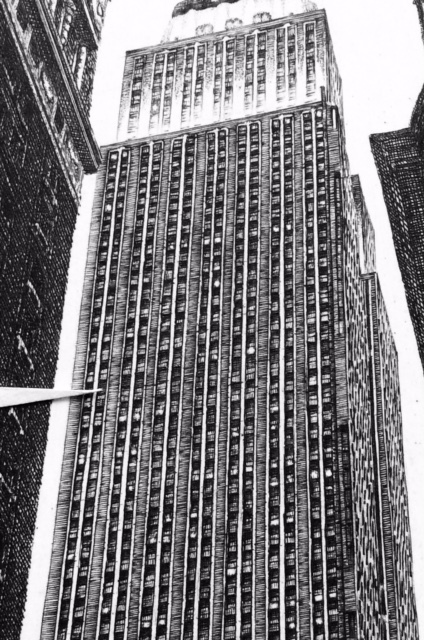 Anyway, the Empire is the most robust sky scraper in Manhattan, showing us a masculine brave shape even unto this very day. I visited New York City again five years later. When I was walking down Broadway, I was surprised to see the left direction crossing the 33rd Street, thinking that the Empire would look unchanged. I was surprised to see an incredible sight. A brand new building is built in front of the Empire! The thin space on the left was lost, and the balance of the whole was also lost. It is pity that I can no longer feel the tension in that tight space, but we cannot them to tear down the new building just because of this loss in view on the Empire, it cannot be helped. I guess it is okay, at least I could record the landscape of New York’s growth and transforming skyline sights with in my own works, time overtakes all things. I searched Wikipedia, and found the report, so I posted it on my website. As the story goes, on July 28, 1945, a B53 bomber of the US Air Force was headed for Newark airport in New Jersey, New York had a foggy day and night and the bomber was trying to make a low altitude landing. The bomber had been flying at 400 km/ h when it collided to the north side of the 79th floor of the Empire State Building at 9:49 am, entering the building. A fire broke out on the 79th and 80th floors. 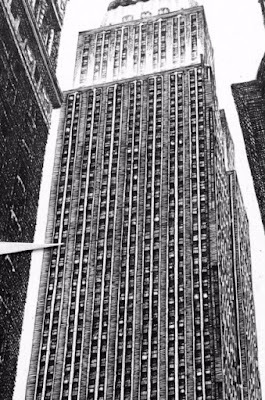 The engine of the bomber dropped down the elevator shaft, causing damage on the basement floor of the building; in this accident, 14 people were killed. The damage to the building was one million dollars at the time (which would be about $14 Million in 2018 dollars), damage to the structural frame work was small, and business resumed on the 2nd day after the accident. When you are walking down Broadway and arriving at the City Hall past the entrance of downtown, you arrive in an area near China Town. There is a road with a good view that is elevated to the left, and connected to the Brooklyn Bridge, and crossing the East River. A thick steel wire is tightly stretched on both sides of the bridge, and the bridge it is made of a natural flooring of wood and I wanted to go farther. 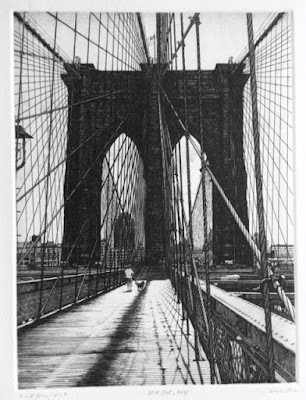 On a beautiful day, it was a sunny spring day in 1997, I decided to walk across the bridge and go to Brooklyn. During that time period there were few tourists on the bridge, and a young man of New York was walking with his black Labrador and they were walking towards Brooklyn and I took a shot of them with my camera inadvertently. There are three-legged stone gigantic piers in two places, which are in harmony with the wooden floor, a classic and luxurious bridge atmosphere. The downstairs was a car exclusive road, and I saw a lot of cars running without exception. 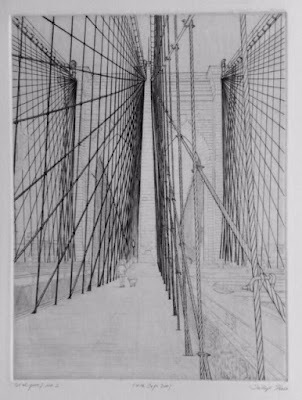 Brooklyn Bridge is the oldest bridge in New York which used the world's first steel wire, and it opened in 1883, and took over 14 years to complete. While blowing in the river wind I walked slowly for about 40 minutes and reached Brooklyn. It was a vacant lot just beside the East River and a huge warehouse standing in the back. I walked a little around the road but it was a very lonesome, so I went back to Brooklyn Bridge and came back to Manhattan. It seems that various old and new buildings stand in line with each other in the gaps between the bridges of the wires, behind which the high World Twin Towers shimmered and glittering behind. It was a peaceful spring day, and a day that no one would ever had expected that in the future there would be an incredible tragedy that would happen. Three years and five months after the first time I crossed the Brooklyn Bridge, on September 11, 2001, late at night in Japan, unbelievable news began to be reported on TV. It was shocking news, that two hijacked civilian aircrafts where used to crash into the two World Trade Center Buildings, and the buildings burned and numerous deaths occurred. There were various rumors about who committed the terrorist attack, and TV had continued broadcasting a scene where the aircrafts rushed into the Twin Towers, and flashed, and crashed, with grey smoke so many times. I knew later that almost 3,000 people lost their lives in this miserable affair, and when I considered the people who died and their bereaved families, I was filled with sadness and dark blue feelings. In the early spring of 1997, I went to purchase a ticket for the Broadway musical “Cats” with Marie, we had to go to the Twin Towers and we took a long-long elevator ride to the ticket office. It was a modern bright interior building; but now, it is a frustrating thought to just imagine that the Twin Tower buildings no longer exist. 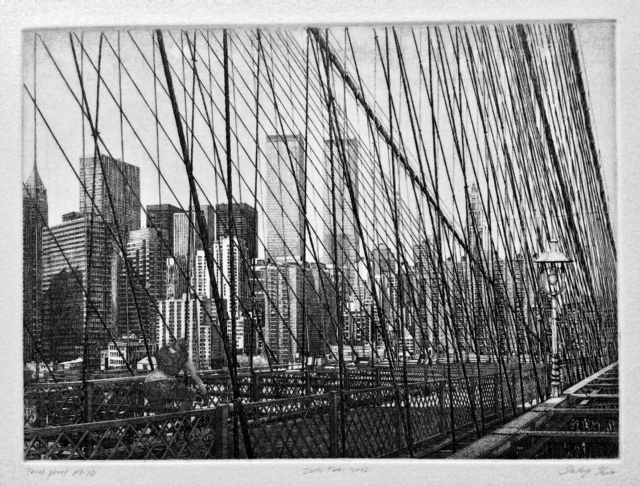 I want to rebuild the Twin Towers somehow, at least in the print. So, I thought, is there any chance that in the past that I took any photos of these majestic building that no longer existed. I seemed to remember shooting a photograph of Twin Towers from the Brooklyn Bridge, and so I searched for the negative films of New York. The Twin Towers was definitely developed on my film images from April 7, 1997. I was lucky to take a picture by chance, that included these great towers. In early November of 2001, I printed the photographs quickly, and made my anger at what had happened there into an energy that drove me into my work; after working hard, I printed the 10 trial proofs and completed the engraving in late February 2002. I regained my Twin Towers on the paper, and felt a little relaxed. The title of the engraving is, “Towers Of Peace;” it was an American friend I had met at the Negishi Forest and Equestrian Park, whom was living in the US Navy housing in the neighborhood that gave me its name. This man’s name is Kevin Vinson, who met at the cherry-blossom viewing party in Negishi Forest Park, he and his wife Rumiko who had come over to my atelier to visit with me, and when he saw this print, and we spoke about it, I asked him what he thought about it and a way to name it, and he said, “It is the Towers of Peace,” since at the time this image was viewed, the world was not into the Global War on Terror. So, he is the one who gave my work its name, The Towers of Peace. He is talented guy who wrote poetry, and has a keen interest in archeology and ancient civilizations. Kevin was also a crew of the USS Kitty Hawk, a US aircraft carrier ported in Yokosuka, Japan at the time of the Twin Towers attack, and in 2001, after the attack, headed off to the Gulf of Oman and into Afghanistan shortly after the incident. The Negishi Yokohama Road in the front of my atelier was busy with buses running with crows, full of passengers returning from the US Navy regimental area to Yokosuka Navy base, it seemed like there was a war immediately there in Yokohama. It was in the evening after a few months, when I was working at my atelier, I heard a knocking sound, and opened the door, Kevin was standing on the corridor with a big smile; we hugged tightly and celebrated his safe return. It was just beginning of the fight against terrorists. I had an opportunity to visit Washington D.C. in April 2002, when I went to the curator room of Arthur M. Sackler Gallery, where I met Ann Yonemura, after a long interval. Ann wanted to see my new work; so, I showed her “Towers of Peace.” After she looked at the new work, she went over to a bookshelf and pulled out a book of woodcut prints, and with a smile she turned over the pages. The Composition in the woodblock print is very similar to my work on Towers of Peace. 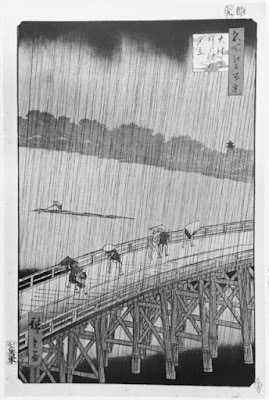 It was a book of woodblock prints by Hiroshige Utagawa, a printmaker in Edo era, “Ohhashi Atake no Yudachi.” Indeed, there are bridges just in front of the screen, people are moving over them, and the scenery is visible behind. The diagonal lines representing the rain within this woodcut print is very similar to the expression of the wire obliquely crossing p-lines of my engraving of the Brooklyn Bridge, in Towers of Peace. The view seen within the woodblock print is of Ohkawa of the Edo era, and the current Sumidagawa area in Tokyo, a river within this modern big city is similar to the East River in New York. Although I did not intend to produce this engraving resembling the woodblock print of Hiroshige, it is a rare case where the Oriental and the Western world coincidentally coincided. I recognized the sharp observation power and deep insight that Ann Yonemura has a curator again, and felt proud of my old friend. It is interesting to compare the woodblock print of Hiroshige and converting them into monochrome images and engravings. ©2011-2019 Takuji.Kubo . Powered by Blogger.